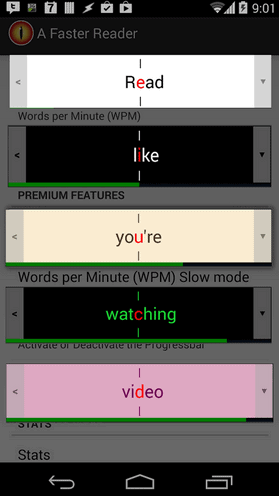 Description: A Faster Reader is the Android app that aims to make reading content on the Internet a whole lot easier than it ever has by displaying one word after another in quick succession in the center of your display. This sounds like something that has been done a number of times, but with a myriad of settings and options on offer make it one of the more powerful options available on Android. There’s theme support, the ability to carefully tune how hast words appear and more. 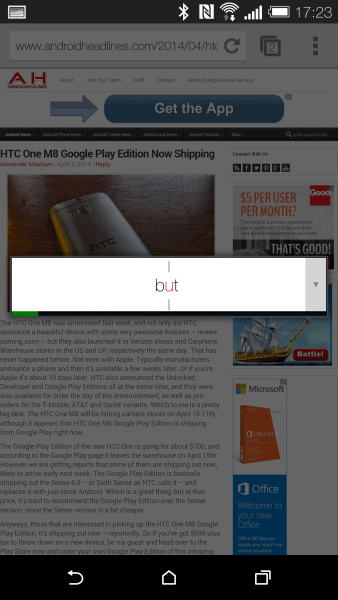 Utilizing the brilliant Android share menu, you can bring whatever content you want into Faster Reader, including Chrome and Pocket. How it Works: Once you’ve downloaded A Faster Reader you can start to read up on just how to use A Faster Reader, which is simple enough really. 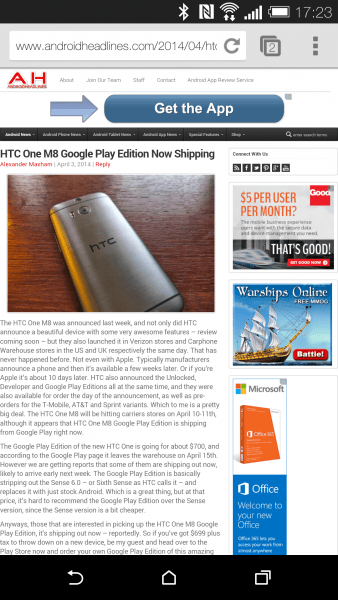 So, as you can see AFR fits in with your Android smartphone really easily. So let’s test this out, heading a story here on the site. I’m a fast reader, so it’s nice to be able to take things in like this, but it definitely takes a little getting used to. You can pause at any time by simply tapping the text. There are a number of settings on hand for you to tweak to your liking as well though. One of the better options available (to premium users) is the ability to change the theme of the overlay, which is nice if you’re reading at night. Also included for premium users, is the ability to resume reading a piece of text from where you left off, very handy for those times you get interrupted. Opinion: A Faster Reader is a great way to quickly and comfortably consume content on the web. Reading very long pieces of writing on the Internet has been made a lot easier thanks to the likes of Pocket (which works great with A Faster Reader), but we still have to read each line the same as always and for some people, that’s not ideal. Faster Reader makes it nice and easy to consume news stories on the go and you can even change the speed as much as you like. 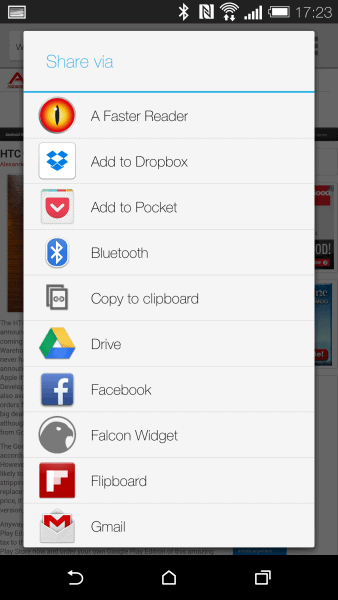 Working perfectly with Android’s sharing menu, AFR is perfectly usable for pretty much any Android user. Speed (4/5) – With varying speeds on offer, you can tailor your experience how you like when using AFR and there’s never any lag when reading through an article you want to read through on the web, either. Features (4/5) – It’s a shame there isn’t any more features included in the free version, but it’s ad free and works great. The premium version makes this an excellent choice for those looking for a new way to read their favorite articles on the web. Theme (4/5) – A good-looking app that fits in well with Android, A Faster Reader features some good-looking menus and UI throughout. 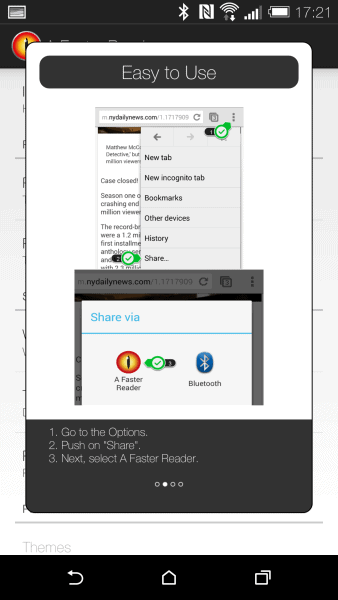 Overall (4/5) – Faster Reader is a simple and effective way to read articles while on the go or just more comfortably and it genuinely works. This definitely makes reading on your smartphone easier, not more difficult as other apps do. Premium features definitely add something new to the whole experience and there’s never any ads getting in the way of things. The Pebble isn’t the only Smartwatch out there, my Sony Smartwatch 2 is left out in the cold here. Conclusion: An app that definitely has more going for it than it does working against it, A Faster Reader is one of the few apps we’ve come across that does what it says it does in this field. There’s no drama here, it just works, and works well. I’d love to be able to get this on Smartwatch 2, but we can’t have everything and there’s more than enough on offer here to keep the vast majority of users, and bookworms happy. 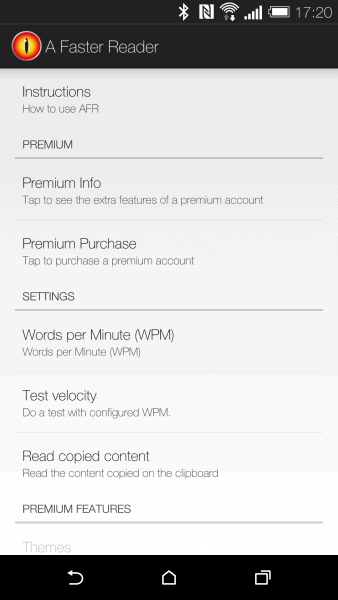 Definitely worth upgrading to the premium version, A Faster Reader is a great app for anyone that can’t stop reading. The post Sponsored App Review: A Faster Reader appeared first on AndroidHeadlines.com |.